A mix of patience, props, and strategy will help foster peaceful coexistence in the workplace. Try using a computer, reading a book, or focusing on absolutely anything. Now try it in the presence of a cat. Nearly impossible, right? Cats stubbornly nap on your point of focus or relentlessly rub against your hands. At least in an office setting, cats defy all stereotypes. 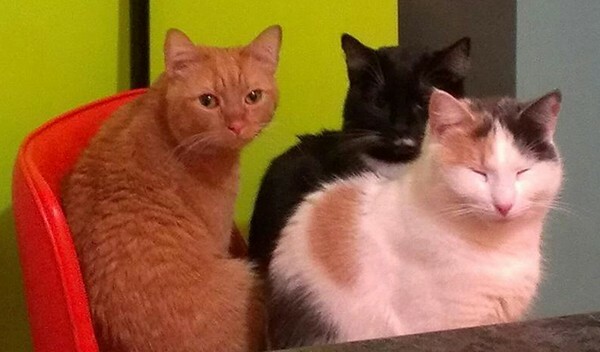 Their desire to be the center of attention can make typing a sentence quite a challenge. It’s inevitable that your feline friend will wind up in your workspace, but that doesn’t have to be a bad thing. 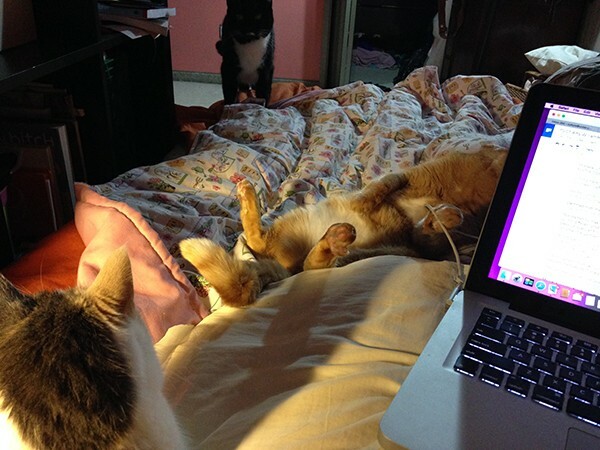 Cats up in your face during your workday can be just as awesome as having cats in your face during your down time. You just need to know how to keep them from getting in the way of productivity. David and Stella like to cuddle in bed at the beginning of the workday. This is especially important if you’re working from home and need to distinguish between a workday and an off-work day for your cat. 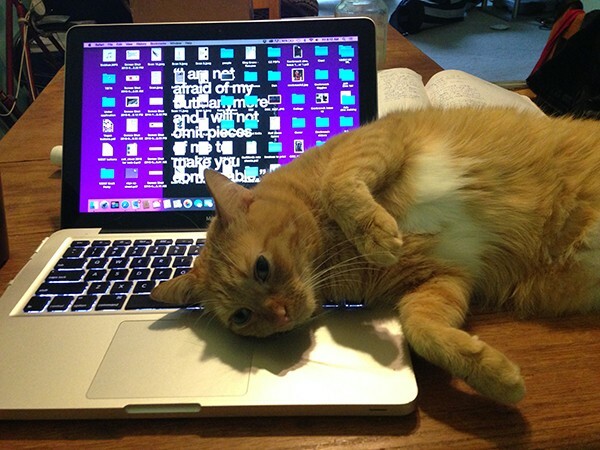 If your feline co-worker gets used to a few activities before you sit at your desk and you need to avert some of your attention from them, they’ll be more likely to leave you be. The routine could be as simple as giving them a treat or a quick cuddle before getting on the keyboard. Suki and David having a nap at the office. You might need to try a few models, but you can probably find a bed your cat prefers to the space on the desk immediately in front of you. 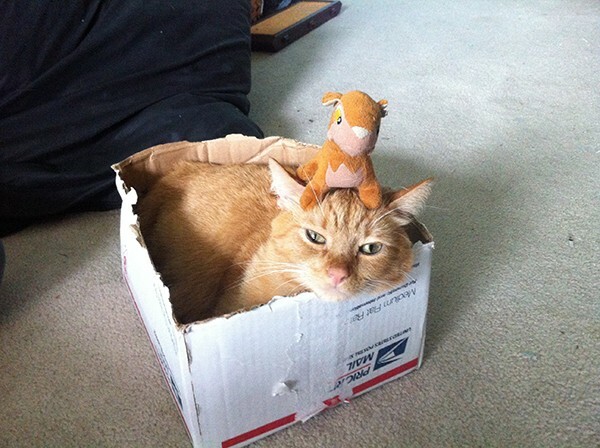 Make sure to place it nearby so your cat doesn’t feel too far away. Once you get the right circumstances, your cat will be softly snoring while you blow through your to-do list. The right box and toy will keep David occupied all day. If there’s nothing on the desk for your cat to check out besides you, then the cat will try to spend time chilling with you between naps. Plop a few cat-friendly plants on the desk. Place your desk next to a window where cats can bird watch. Maybe prop up a scratch board if there’s space. Switch up your distractions from time to time to keep things interesting — at least, more interesting than you. Stella loves snuggle breaks throughout the day. Breaks are a necessary part of the workday: snack breaks, lunch breaks, bathroom breaks, and, if you share your office with a cat, play and cuddle breaks. This will add a little fun to your day, tire out your furry office mate, and satisfy the feline need for attention. 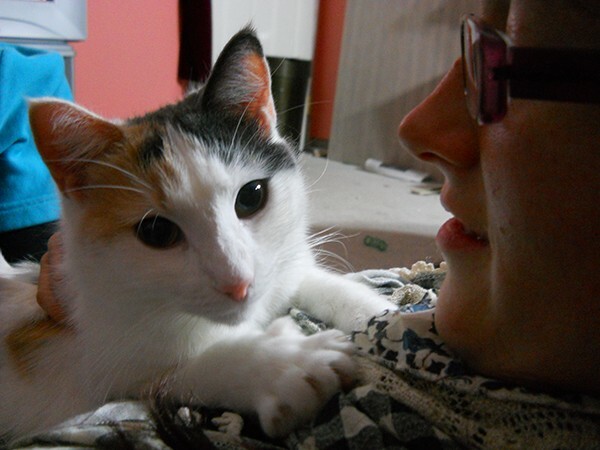 You can stop for some top-quality cuddling or wild play, depending on your cat’s preference. David, Suki and Stella always have someone to cuddle. One cat is great, but two cats are better. Sometimes that might mean two cats clawing for your attention, but it more often leads to them entertaining and comforting one another while you’re busy working. 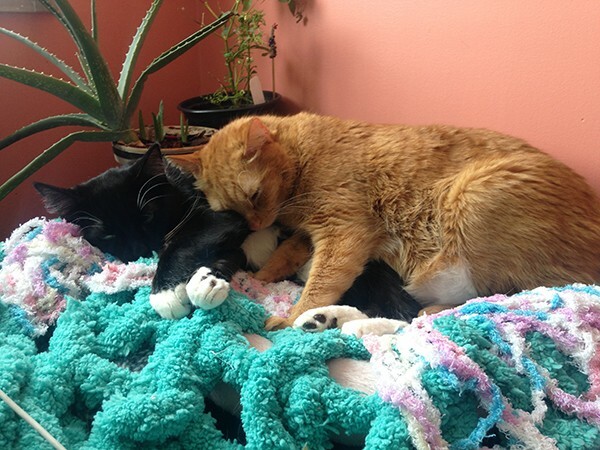 If someone is persistently bumping your hands for cuddles, take her or him to another cat for snuggles or play time. Nothing gets David out of bed faster than a delicious smelling snack. If you’re anything like me, you probably keep a bowl of something to munch on within arms length while you’re working. 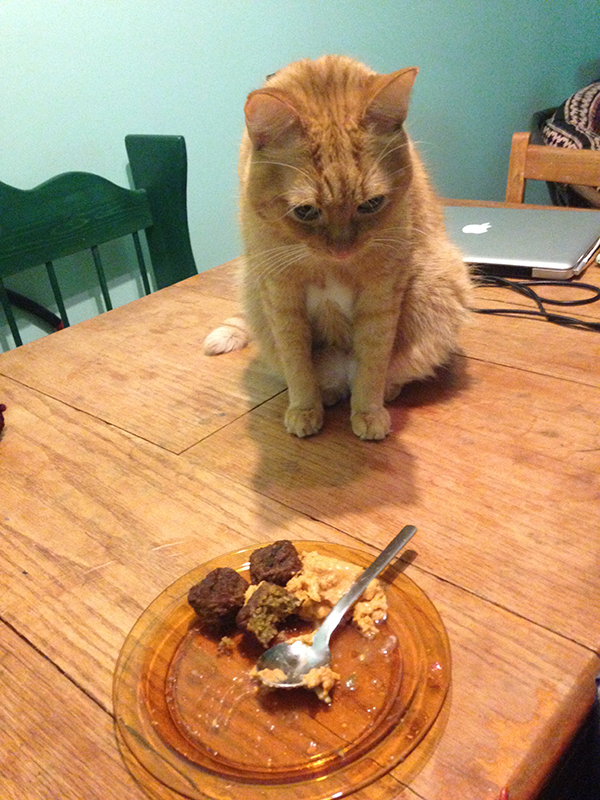 If that snack is even remotely appealing to the nose of a feline, the cat will crawl out of bed to beg for a snack. If you never bring anything your cat wants onto the desk, after a while the cat will hardly lift an eyelid when you clink a bowl. Suki likes to hang out during the day. If the office cat sits on your mouse 5,000 times, move the cat to his or her bed, your lap, or somewhere else 5,001 times. The first little while, it could be difficult to work in a space with such a stubborn creature, but if you’re the more persistent one, the cat will give up with time. David quickly realizes that a moving hand does not make the best pillow. When your patience runs low and you don’t think you can move your cat one more time, persuade her or him to move. 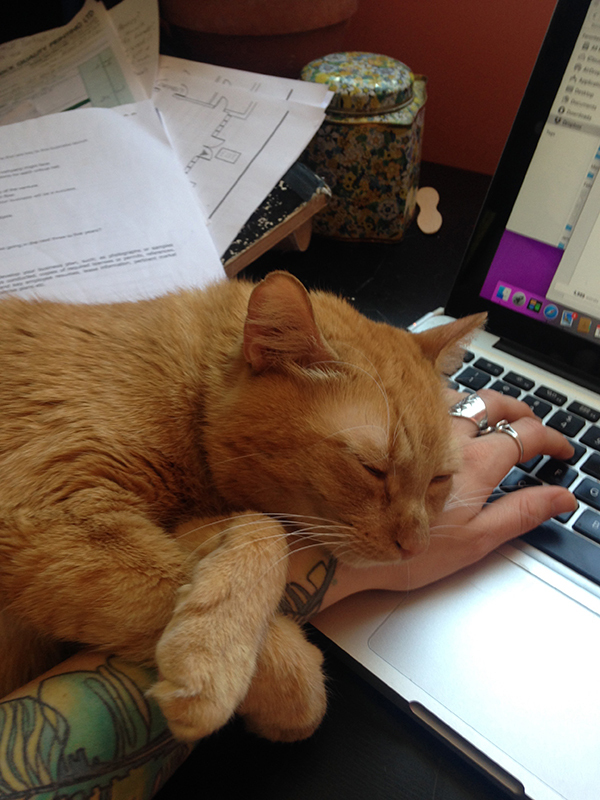 Maybe typing furiously when a cat head is resting on your hand pesters enough to force a move. If your cat doesn’t like hair brushing, tooth brushing, or nail clipping, take out your tools when the cat slips in front of your computer. She annoys you, you annoy her. It’s only fair. Some days, David just really needs a little extra love. Some days, your office mate will probably get in the way and need a bit of extra attention. Like a co-worker who talks too much, that’s just something you sometimes need to politely deal with. Take an extra break or two to play or cuddle, or do work that allows you to pay attention to your cat while getting it done. 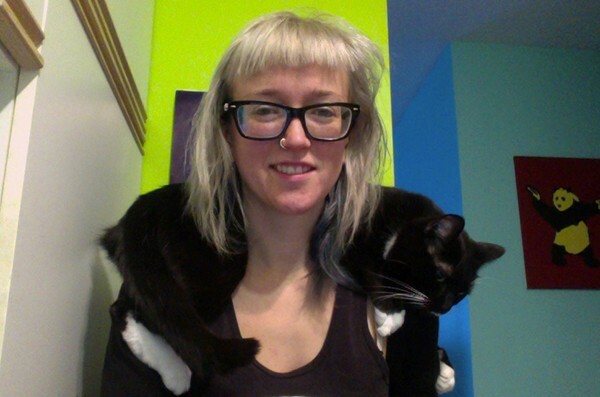 Place your cat’s bed directly in front of you, or maybe just let the cat chill on your shoulders.